Medical interview before the treatment. If you have any place you have pain or injury in your body, please let us know in advance. Must be changed to a special Thai wear before the treatment. After changed to a Thai wear, the treatment will start. First of all, we will masage around the feet using hot towel. After the feet massage, we will start massage your back, neck, arms, shuolders and so forth. With traditional Thai massage, settle back for a slow rhythm massage; no pain, but plenty of pleasure. 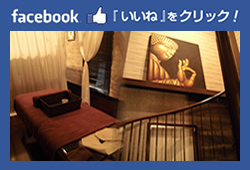 Coran's Thai massage improves bad circulation of the blood, and improves circulation. It involves activating lymph nodes flowing to stimulate osteopathic energy routes that circulate through the human body,. It's called "SEN". Thai traditional medicine, believes that human life is to be composed from the following three. ①　BODY - Composed of the four elements of wind, fire, water, and soil. ②　SPIRIT - Presides over the mind, memory, thinking. ③　ENERGY - Adjust the flow of human body and each organ. Out of these three, the energy called "PRANA" which flows through the body, and the path of PRANA called "SEN" are phase component. It is impossible to be confirmed by eyes, but the cancellous PRANA　energy run throughout the body. Activate the PRANA by stimulating the SEN path, will ehnhance the healing power which originally human have, and lead to right direction on the body in good health.